One thing Kate and I have always wanted to include on the site, but never really had a great place to do it (before The Scoop!) are travel reviews. Every time we mention we’ve traveled somewhere we get loads of comments and emails asking for details and opinions and ideas. Now that summer is nearing, and people are starting to think of family vacations, I thought it would be fun to share some of my favorites here on The Scoop. I want to make it very clear that these are NOT sponsored posts. No one is paying for our trips; these are things we’ve planned, carried out, and financed our own and I just thought it would be fun share, and hopefully useful for others planning on trips, whether they be fun outings close to home, or big trips across the globe. So first up in this installment is one I got a lot of interest in, when I mentioned I had been there in a previous post. (If you haven’t made these Hawaiian Style BBQ Ribs with Grilled Pineapple, oh my gosh do it now.) My family loves Hawaii. I mean, who doesn’t? We’ve taken several family vacations there and have explored lots of islands. The one we go back to over and over again is Kauai (that can be another post) but last time we did something a little different and stayed at the Aulani Resort on Oahu. 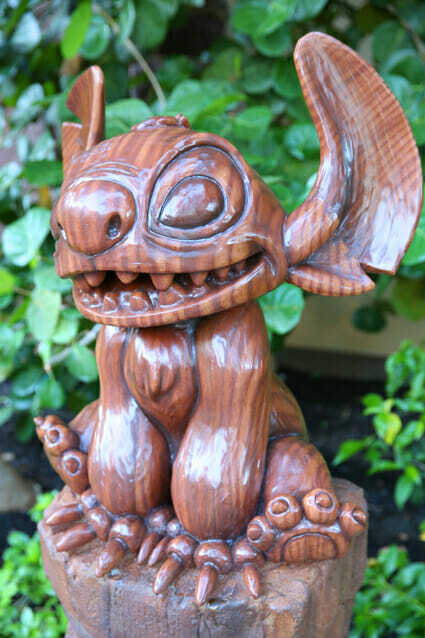 My husband had a medical conference to attend, and who sends their husband alone to a Disney Resort in Hawaii?? Not this chick. So we made it into a family vacation. 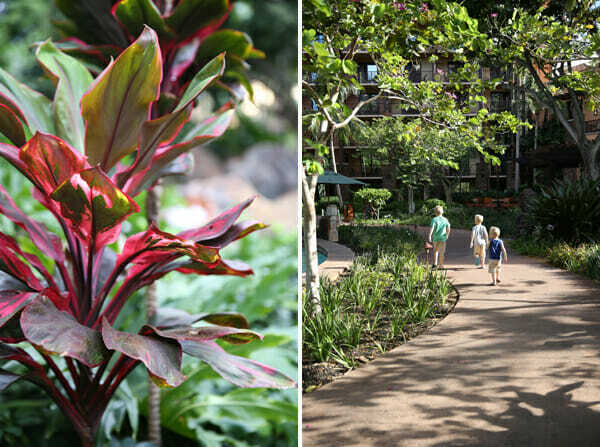 *Note that some of the photos in this post are taken from the Aulani website. It’s pretty obvious which ones. If it’s short and rectangular shaped, or shows random strangers that aren’t members of my family- it’s from Aulani . Location: The Aulani Resort is part of the Ko Olina Resort Community & Marina, located on the western shore of O‘ahu about 17 miles from the Honolulu Airport and a short drive Waikiki. 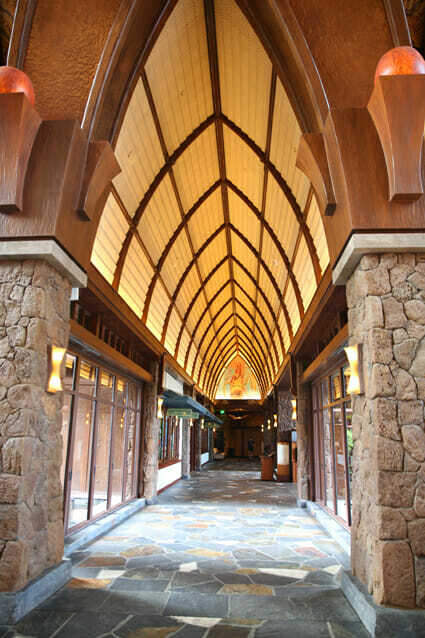 Aulani rests on 21 acres of beachfront property. The grounds are beautiful and we found we had fun even when not in the water wonderland, but simply wandering around exploring all of the nooks and crannies. 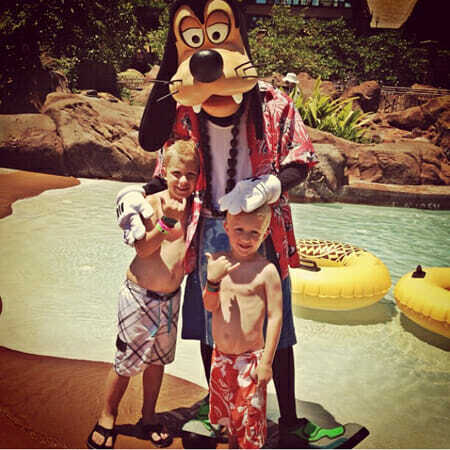 The resort is owned by Disney, so it’s incredibly family friendly. They have regular hotel rooms, and also villas and suites with eat-in kitchens, etc. You can see their room options here. I have to admit, when I heard it was a Disney resort, I worried it might be a little too…Disney. I wasn’t interested in going to a Hawaiian Disneyland, but that wasn’t the case at all. The Disney influence is there, but it’s very subtle, and done in a really classy way. The entry of the resort is beautiful. But it’s not over-the-top Disney, which I liked. The resort itself has everything you would expect a nice resort to have, like good restaurants, shopping, great service. The center of the resort is quite literally a paradise. Pools– There’s several pools, and they all include areas with shallow wading water that’s great for young children to splash around in. The resort also offers free life vest rentals, which I thought was awesome. And they’re the squishy comfy kind. 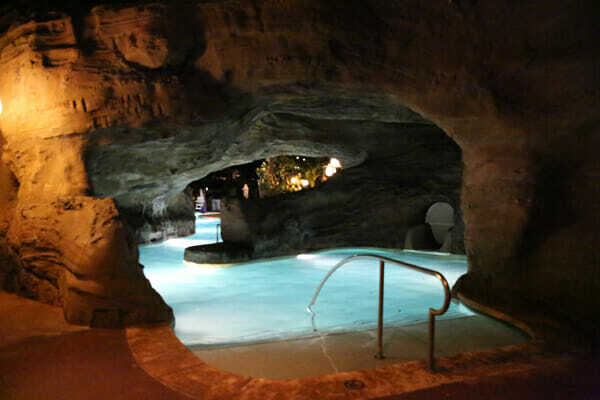 In the center, sits a giant volcano with 2 different water slides that go down it and some caves you can swim through. It’s surrounded in shallow water (like, a few inches) and is basically like a giant jungle gym that has water spraying all over. My little boys loved this part, and I loved that they could freely run around without me being as worried about being in a deep swimming pool. 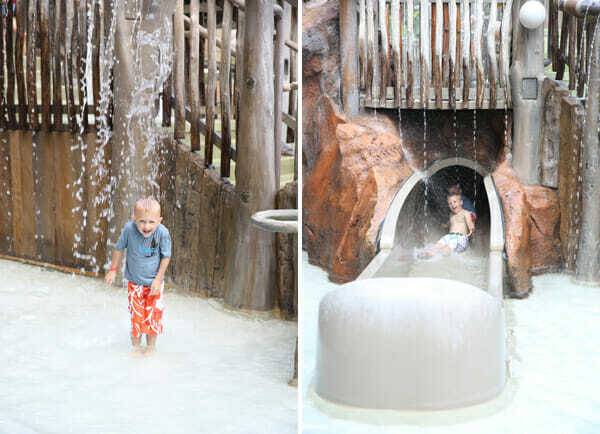 It was a great place to splash, play, and run around. The Reef– another fun thing is that there’s a big snorkeling lagoon right in the middle of the resort, amid all of the swimming pools. You can hop in and explore the underwater world, and friends and family can watch you through a window below. 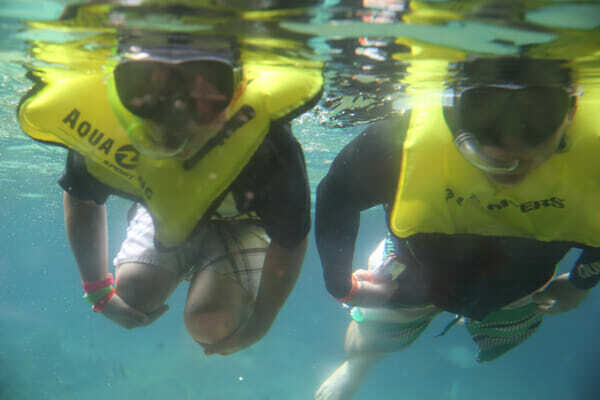 My younger boys, who weren’t quite ready for snorkeling, loved watching Dad and big brother through the window. Aunties Beach House– Before we left, my husband told me there was a child care center (for kids 3 and up, and potty trained) on the resort and I told him that was ridiculous. Who goes on a family vacation and leaves their kids at daycare with strangers?? Well. I promptly ate my words. It’s no daycare. I didn’t get any photos of this place (so I’m using one from the website.) But this is a 5,200 square foot gorgeous house. Think Hawaiian Pottery Barn. There’s endless rooms full of dreamy toys and activities. There was an art room filled with fun art supplies and big work tables, a gaming room with probably 16 different gaming systems (Play Stations, X-Boxes, Wii’s, etc), a movie room with a big screen and Disney shows, a dress up room full of costumes, several play rooms with interactive tables (think coffee table, but the entire top surface is a giant iPad! ), and outdoor play area, and more. They have free play, and then tons of planned activities for children like science lessons, Hawaiian crafts, story time, song time, etc. The staff there was wonderful, and plentiful. There were so many adults and youth counselors that it seemed almost everyone had their own chaperone/play buddy. They were all incredibly kind, fun-loving, and so helpful. I was very impressed at how well run it was, and my kids loved it. My husband had meetings most mornings, and I found out very quickly that watching 3 small children in the water by myself was overwhelming. So we would all wake up and have breakfast and then when he went to his meetings I would take the kids to the beach house. That allowed me to hit the gym, get our things ready for the day and snag a good spot by the pool. When meetings were over before lunch we’d grab the kiddos and spend the rest of the day playing. They had a blast doing crafts and activities and loved making new friends, too. 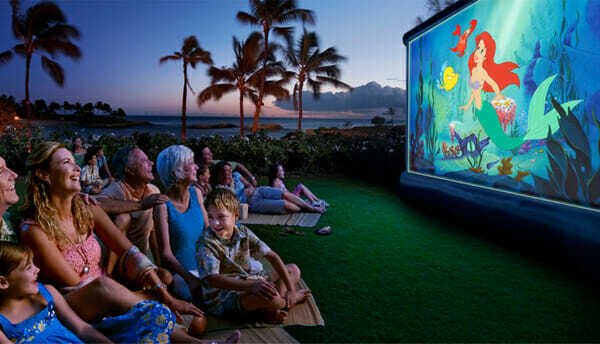 Outdoor Movies– there’s lots of fun activities, and our kids loved the outdoor movies each night under the stars. 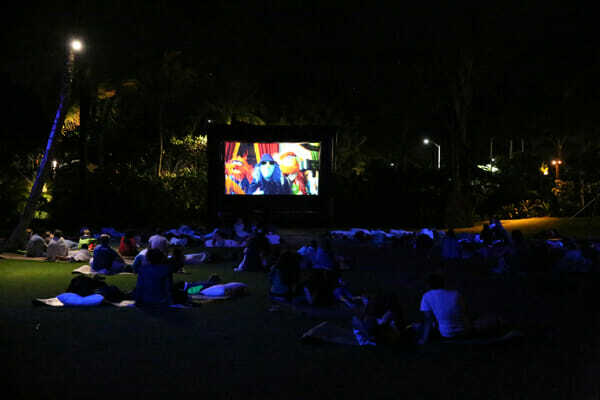 You can bring a pillow, and they provide woven mats and everyone grabs a spot on the lawn for a Disney flick. 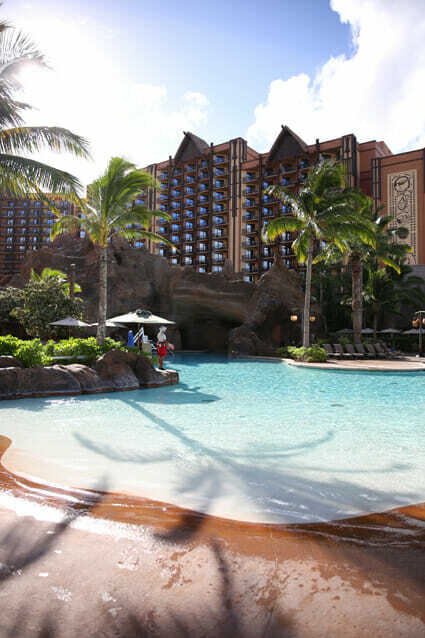 Beach- a few steps away from the resort pools is the Aulani Beach. It sits in a calm lagoon, so the tiny waves are gentle and it’s perfect for swimming. We found it also didn’t get very crowded, aside from the very middle of the day. We’d usually go in the morning or late afternoon, and found it really peaceful. 1. The Price. If you’re a member of the Disney travel thing, it’s probably a better deal, but straight-up out of pocket, it was pricey. 3. It’s a resort. Again, this could be a major plus for a lot of people, but we’re not really resort people. We usually stay in a house or condo where we can go to Costco and buy groceries for the week, do our own laundry, and most importantly, explore the island and not be surrounded by a bunch of other people. I don’t love vacationing surrounded by other tourists. We like to be off the beaten path a little bit and hang out in local joints and beaches hidden away. It’s just more our style so the whole resort thing is a different type of vacation. That being said, our family had a great time there. Our kids still talk about it almost a year later. Hopefully this post is helpful for anyone considering an Aulani vacation, or if nothing else, a mental vacation for you today 😉 If you have any questions that I didn’t cover, don’t hesitate to ask! We’ll have more posts in our travel series throughout the summer. Just one note…Aunties Beach House is for kids 3 and over (and potty trained). Unfortunately my kids were 2 and 3 1/2 when we stayed at the resort my older did not want to go alone, they also were in bed before most of the night time activities. We still had a great time but feel had our kids been older we would have received more bang or our buck. How fun! I really want to go to Hawaii. Thanks for posting. I want to go! I can see why your kids are still talking about it. I’m dying to go to Hawaii, so this post was just way too dreamy. 🙂 Thanks! What a fun post! I grew up on Oahu and we used to go camping at Ko Olina in the summer. There are several lagoons there now, but back then there was only one natural lagoon and we spent ALL day, EVERY day in there. It was so fun. 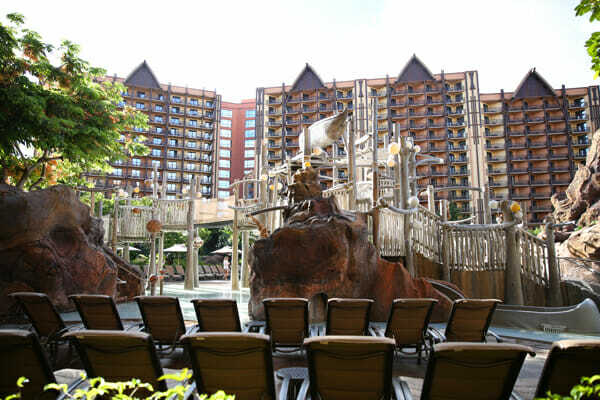 I’d really love to go back and visit Aulani now, it looks like a blast! Thanks for sharing about your trip! You are so brave to take your children on that long of a flight. I don’t think I could do it. It looks like your trip was well worth it, though! Thank you for sharing! As long as our kids have loaded iPads and headphones, they’re terrific! I’ve even made that trek with a 4 month old, and again with a 1yr old, and It wasn’t half as bad as I expected. My family loves Disney! Thanks to having annual passes, I try and take my kids every few weeks. Every timewe are there I see the kiosks promoting Auilani. I so wish we could bring our kids here (though a vacation like this is not in our budget… at least not for a very long time). However, my husband and I are talking about going to Hawaii for our anniversary in a couple years. I have been to Kauai & he hasn’t been to Hawaii at all. We like to do the grocery store thing too and cook most of our food. So, I guess my question is, do you have a favorite island/place to go in Hawaii when it is just you two? We always go pack to Kauai and stay in Poipu. It’s our fave! Lol, I’ll get it up this summer for sure! I agree. Oahu is not my favorite island, either. But this resort seems perfect for me and my young family. This place looks awesome! I have always wanted to go to Hawaii but never have. This place looks like a must do. Great idea to do vacation reviews! To check it out without the cost. I have been to Oahu five times, Maui once, need to hit Kauai. I think if you’re going to go to Oahu you must always stay on the North Shore to get the full island experience. The southern part of the island is very touristy and busy. I’ve rented a condo in Haleiwa and gotten Costco supplies and had a great time! I love late May/early June for less crowd overall but fall is nice too. Hawaii is our favorite place! How fun! 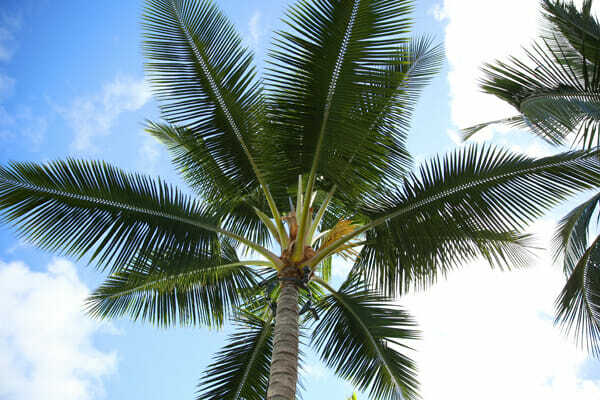 I’ve always wanted to go to Hawaii, so it was really fun reading your post–thanks for sharing! I have only been to the Big Island which was really fun and adventurous, especially watching lava flow into the ocean. I really want to go to Kauai! I have heard it is so green and beautiful. I really enjoyed this post. I loooove Hawaii. I’ve only been to Maui and the Big Island so far, but we have a trip planned to Oahu this summer. 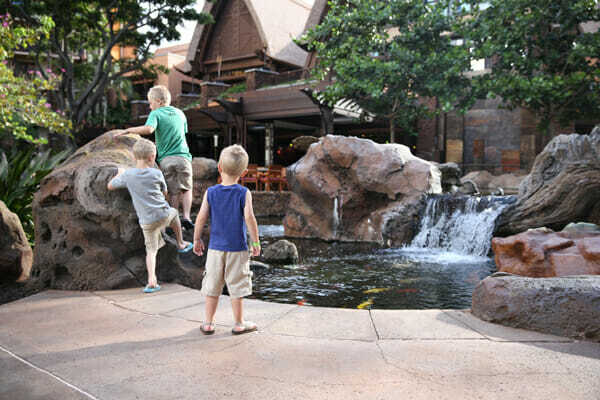 We have two little guys (2 1/2 and 5 years old) and we considered the Aulani, but like you, I was afraid it was going to be too Disney. I definitely love Disneyland and grew up going there (we live in Southern California). We decided not to stay there, but after your plats maybe we’ll have to go check it out and eat at one of the restaurants. Would love more travel posts! We are planning a vacation to Disneyland, it won’t be for another 18months but we’re starting to plan now. I don’t know if either of you have been there, but any info or tips about planning that trip would be great. Ways to save money, best places to stay, etc. I love Oahu, the north shore is my favorite place to stay, but this looks amazing! I need to look at the fliers for conferences we get in the mail more closely! What’s your husband’s specialty? I wanted to chime in and say that even if you don’t stay in one of the Ko Olina resorts, you can still go to the beach there! My husband and I went to Oahu last November and stayed on the North Shore. We wanted to go snorkeling, but since the waves get huge on the North Shore in the winter, we had to drive all around the island for places to snorkel. 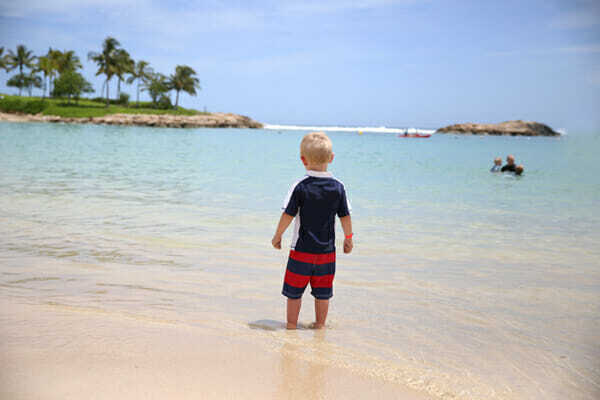 The lagoons at Ko Olina were awesome to snorkel in, and not busy at all when we went! We probably saw a greater variety of fish there than we did at Hanauma Bay, and we even saw a sea turtle! There are a few lagoons, so we just explored each one the morning that we were there. I would highly recommend it! Also, the guidebook “Oahu Revealed” was pretty useful to us in planning our trip. Hopefully this helps someone planning a vacation there! Sara, we are going to Kauai for the first time this June and we are so excited! I’m crossing my fingers that your post will be up before we go! I love the Revealed series! (Sigh) just one more place on my dream list. It looks lovely and I’m always looking for travel tips and reviews. Help! Didn’t you do a different post on Hawaii? After reading something about a trip you had taken there, I promised myself if I got the chance to go to Hawaii I would first re-read that post and go from there. (Your opinion pulls weight around here.) I thought you mentioned a house you stayed in…? Maybe from vrbo or something of the like? Anyway, I’m finally getting the chance and can’t wait! We’ve done a few posts! What island were you interested in? I’ve talked about Kauai, and Kate has written about the Big Island. Oh thanks! I found Kate’s post about the Big Island….Hmm beings this is a first for me (Hawaii) I’ll def be doing some research. Thanks for posting! This was quite helpful as we’re planning on going there in Sept.
A few questions: do you think we should bring our own snorkle gears? floaties for the lazy pool? Some people are recommending that and am not sure if we should bring it vs getting it there? Oh, and any recommendations on cheap eateries? Wow! The resort is so big!! Why I have never heard about this place!! Thank you for sharing your experience. I hope I could come there once.